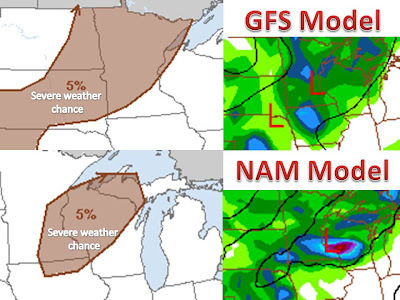 A couple opportunities for severe weather Thursday and Friday. Another slow moving cold front will push south from Canada by the end of the week. Widely scattered thunderstorms will develop tomorrow in and around the brown shaded area. Some of which could be strong, with the primary threat being larger hail (given the cold air aloft). The storms will weaken as the sun sets and thier energy is stripped away from them, the storms will then redevelop in Wisconsin on Friday. Same general scattered nature as Thursday. A "slight" risk of severe weather may be needed for tomorrow and more so on Friday. Be sure to keep it to www.midwestweather.org for updates.